Sometimes, particularly when I give lectures, I watch as a bewildered crowd looks at me with horror. Inevitably someone says, “your poor models!” and heads nod in agreement. You see, I put my friends through some rigorous photo shoots – nothing I wouldn’t put myself through, mind you – but nonetheless uncomfortable. The way people react to realizing I’ve covered my friend in, say, wax, is almost always disgust…as if I did it without their consent, somehow. It almost makes me laugh, and we always get the misunderstanding straightened out. Why yes, in fact I did have express permission from my model to pour wax all over her! “Oooh, okay then!”. And so we have it again, another hair-raising story filed under “Things I Do to my Friends”. 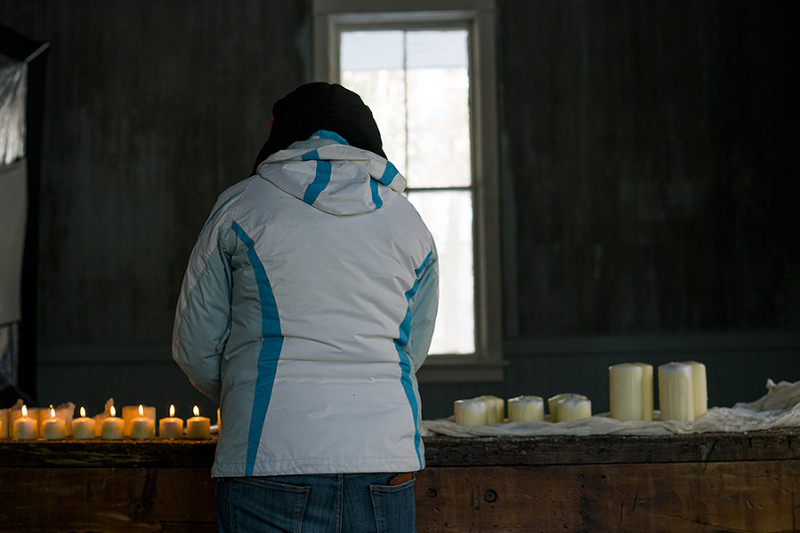 I flew to Wisconsin to do two photo shoots for my death series called Samsara. What ended up being a $3,000 trip (more on that later) yielded no usable results, and I proceeded to begin my long, long artistic breakdown (yet again for another blog post). But in the moment, it was exhilarating! My friend Dave Junion in Wisconsin happens to have an abandoned train depot on his property, so I used that space to create in. Old, blank, beautiful, falling apart. All I needed was some candles, a table, and a candelier. Unwisely, I brought the chandelier all the way to Wisconsin with me. I checked a bag just for it. It weighed 40lbs and undoubtedly TSA was concerned, but it made it through. I found the table outside of another friend’s house in Wisconsin (you’d think I grew up there, but no, I’m a Pennsylvania girl). I assembled everything I needed, from a high-powered heater to a blow torch, candles, fabric, table, chandelier, and smoke bomb. All gathered, it took me a full day to organize with the help of my friends. This was the test shot for the pose. We had to make sure that she could hold it comfortably enough for a lengthy period of time. And then the torturous part. I asked my friend to lay naked on a table covered in ice for the better part of an hour while I slowly melted candles on her bare skin. AND IT WAS SO MUCH FUN! Here we are – proof of the laughter. Necessary so I’m not indicted. We laughed so hard through the whole thing that I was afraid the candles were going to fall over on her body! I kept yelling at her to stop laughing which only made us laugh more, but I promise you, no one was injured. The high powered heater didn’t hurt either, especially since we were in an abandoned building and it was 20 degrees F in the room. Did I mention it was February…in Wisconsin? The only problem with the heater was that it created two very different temperatures in the room and my smoke just tabled off at a certain height. I had to run around like a maniac waving cloth around to get it to disperse. I used the window in the space for natural light, but needed to make sure it was dark enough that the candles had some effect. 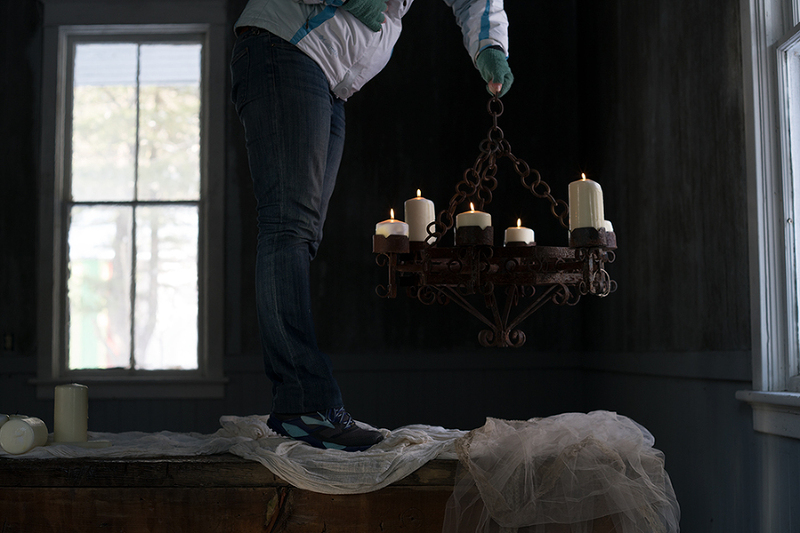 I photographed the chandelier first, hanging above her, then removed it and lit the candles. After I had some shots of her and the candles, I ran around the room with a lit smoke emitter so that I could get the hazy, smoky effect. This image, an homage to classic paintings and particularly religious art, didn’t end up making it into my series. I ended up going in a different visual direction in which no locations were used at all, and the figures were more abstract than literal. 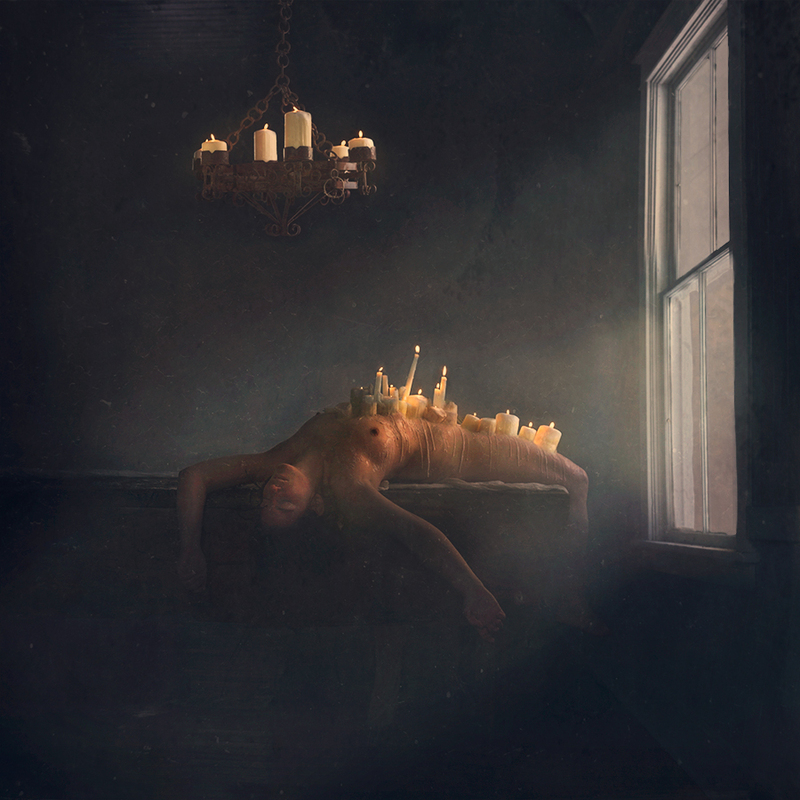 However, I love this image, so on it’s own it exists in my heart as everything it was intended to be: a meditation on mortality (using candles to signify a vigil) and a look at the delicacy of death. I am often inspired by paintings, especially Gothic, and looked upon “The Nightmare” by Henry Fuseli as a great inspiration. The pose and the lighting played a large role in creating this image. Through the series, both what was not used and what is being used, which I will share with you at a future date, is inspired by Gothic paintings. Next I’ll share the really harrowing story of how I hung a glass coffin tied to trees 10 feet in the air in a beautiful forest in Wisconsin. Until then, my dears…until then. Model is my best friend KD who looks as though she’s stepped out of a classic painting, and we love taking advantage of that. She’s quite literally the best, and I hope everyone finds their own KD in life with whom you can melt candles on. Vicki Kurasz - This is so awesome. I love this artwork of yours and I also fell in love with “The Nightmare” the first time I saw it. All though I really do understand the photo not being what you want it to be, I really do like this. To me, it has that old masters feel. And it looks like it was so much fun! Jen Kiaba - Even if this didn’t make it into your current series, I think the shoot ended up being worth it on many levels. Who knows, it may find a home in a future series. But I think the thing that inspired me at PPC when you were talking about these images that didn’t make it into the series was how willing you were to try and learn in the face of “failure.” I’m sure that mid-artistic breakdown it didn’t feel that way, but the emerging from that breakdown is so powerful. Thank you for sharing this with us.